An early rendering shows what an expanded Crisis Brewing facility could look like at the southwest corner of Archibald Yell Boulevard and South College Avenue. 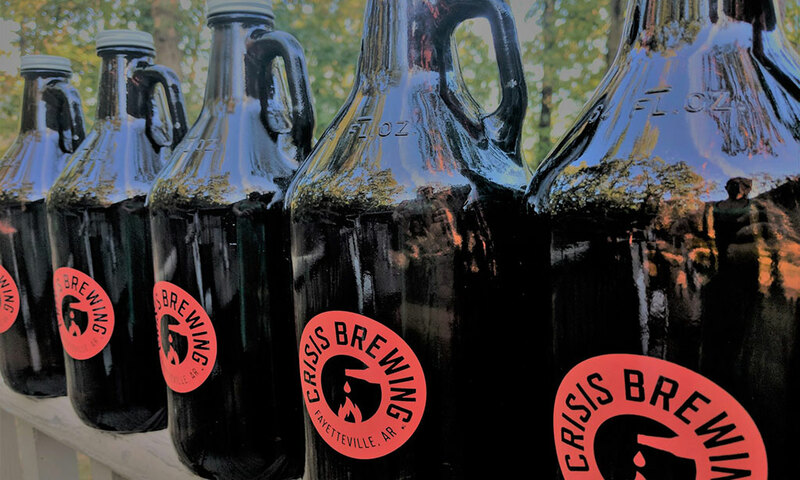 Crisis Brewing is already planning an expansion in south Fayetteville. 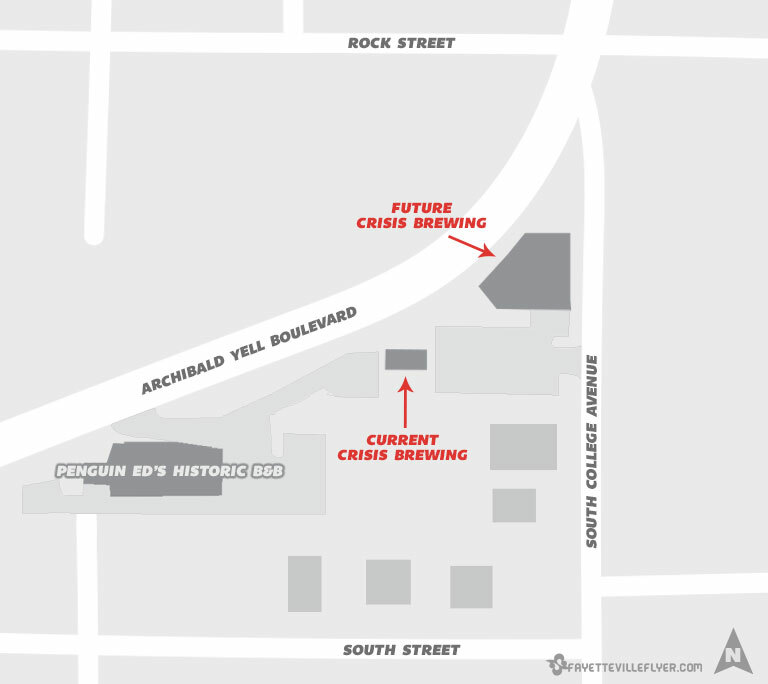 The company, which will soon open its first location on Archibald Yell Boulevard, this week submitted site improvement plans for an adjacent 4,950-square-foot brewery and restaurant with a rooftop bar overlooking south Fayetteville. Liz Slape, who owns Crisis with her husband and head brewer Sean, said while it may seem a bit premature, a larger facility was always in the plans. In fact, the idea for a rooftop bar was part of the original spark that set Crisis in motion. “Fayetteville has so many great views, but not enough places to sit and enjoy them,” Liz said, adding that her family owns land at the southwest corner of Archibald Yell and South College Avenue. The site’s topography lends itself to views of south Fayetteville from the intersection at the top of the hill. Liz’s father is Ed Knight, also known as the “Ed” of Penguin Ed’s, who operates the restaurant’s Historic B&B location next door to the current and future Crisis Brewing sites. Being the daughter of the longtime Fayetteville restaurateur led Liz and her husband to tinker with the idea of a restaurant with a rooftop bar on the land, but Sean’s 10-year homebrewing hobby pushed the couple in a different direction. And that’s where the small, soon-to-be-open Crisis Brewing taproom idea came into play. Instead of waiting a few years to get through the architectural planning process and construction phases needed to build a brewery from the ground up, the Slapes decided to first focus on getting the Crisis brand off the ground and getting Crisis beer into people’s hands. The two plan to open their first location in March inside an existing building next door to Penguin Ed’s Historic B&B. The space sports a two-barrel system and features small-batch production in a small taproom environment. Specific plans for the upcoming expanded facility are still in the works, but Liz said the new building will house a larger production brewery as well as a restaurant. Plans submitted this week account for a two-story building with nearly 3,000 square feet of space on the first floor and almost 2,000 square feet on the second floor, including a rooftop bar. A parking lot with an entrance on South College Avenue would include room for about 25 cars. It could be at least a couple of years before the larger brewery is complete and ready for business. 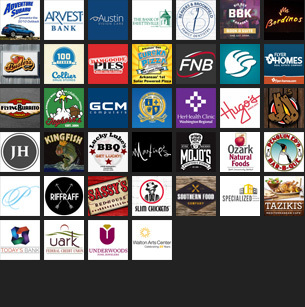 In the meantime, the Slapes hope to cultivate a following of thirsty beer drinkers in south Fayetteville. Liz said the smaller taproom will likely stay open once the new facility is complete, and that it could be used as a pilot brewery or even serve as some type of educational facility. “There are so many details we have yet to consider, but we’re already very excited,” she said. For now, the Slapes are finalizing the buildout of the smaller taproom and putting the finishing touches on the first test batches of beer. If all goes according to plan, Crisis should open on Saturday, March 17, just in time for St. Patrick’s Day. The preliminary plan is for the taproom to be open Thursday through Sunday, with hours somewhere in the neighborhood of 12-10pm (subject to change).